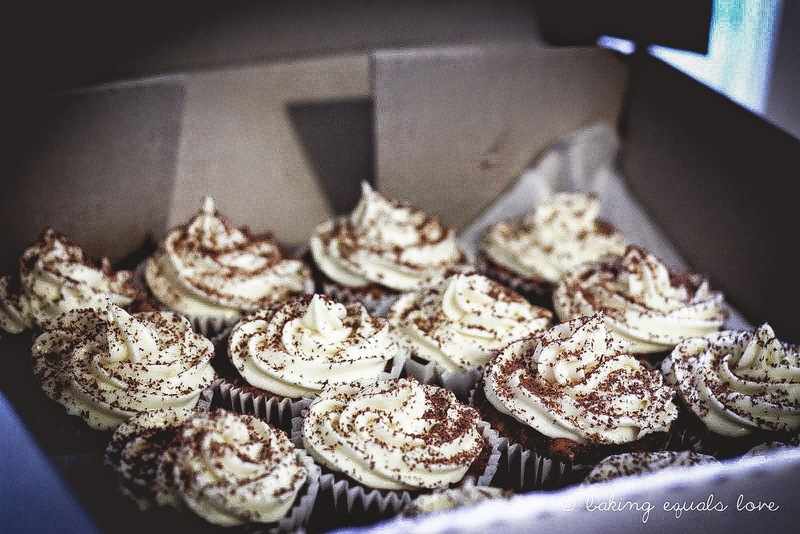 At the time, there weren't a lot of banoffee cupcake recipes out there in cyberspace, so I set about creating my own. The recipe is a mish mash of a number of different recipes: banana cupcakes, homemade dulce de leche and cream cheese frosting. 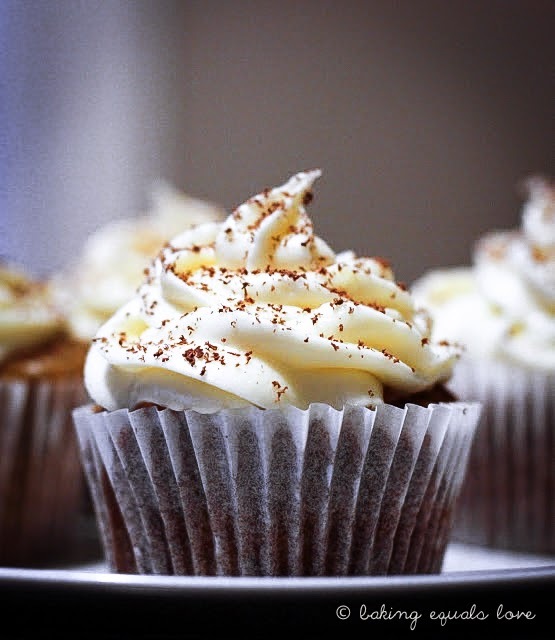 The secret to a good banoffee cupcake is to use really super ripe bananas. Like the really spotty brown ones that look like they are almost past it. The browner they are the more the sugars have developed in the flesh making them sweeter and have a more intense banana flavour. I always leave bananas sitting in our fruit bowl till they get to that stage then pop them in the freezer in their skins (which will turn completely brown). Then when you need to make banana cake or banoffee cupcakes, you can just take them out and defrost for about 30 minutes on the bench (or 1-2 minutes in the microwave) and just squeeze the gooey banana out of their skins. My very good friend moved down to Ohope a wee while ago now so we only get to catch up sporadically. We call each other super geek twins, because back in first year pharmacy we had very similar study styles (read: we were total harry hard outs). Now, seven years down the track we've discovered that we're both obessesed with baking and cooking. From super geek twins to super domesticated twins. Take wrappers off cans of condensed milk but do not open the cans. Put cans of condensed milk in large pot (like a stock pot), cover in water (make sure there's double the height of the cans of water coz if the water runs out the cans explode!). Bring the pot to boil and boil for 3 ½ hours, ensuring cans are always covered in water. The longer you cook the cans the more caramelised the toffee is and more solid it gets. Leave to cool in pot. You'll need ~ 2 cans for 24 cupcakes, I always make a couple more cans and leave them in the pantry for next time. Stores for ages in pantry. Unless of course you're like me and can't resist temptation, in which case it won't last at all because you will have eaten it all straight out of the can. Alternatively, you can just buy cans of Highlander condensed milk caramel but I reckon the homemade stuff tastes much nicer (more toffeey and less condensed milky). Make sure you have the oven racks evenly spaced in the oven so two trays of cupcakes can fit. Preheat oven to 170oC. Line two 12 hole muffin trays with cupcake papers. Sift together flour, baking soda, salt, and cinnamon in bowl. In a separate bowl, beat butter till fluffy for 1-2 minutes. Add the caster sugar, a third at a time, beating for 2 minutes after each addition. After the last addition, beat until the mixture is light and fluffy and the sugar has almost dissolved. All this beating seems excessive but beating the heck out of the butter and sugar makes for a light and moist cupcake. Add eggs one at a time, beating for 1 minute after each addition, or until mixture is light and fluffy. Add the vanilla and beat until combined. Add a third of the flour mixture to the creamed mixture and beat on low speed until just combined. Add half of the buttermilk and half of the mashed banana and beat until combined. Repeat this process. Add the remaining third of the flour mixture and beat until thoroughly combined; do not over-beat as this will toughen the mixture. (This is the dry-wet-dry method for making cakes again to ensure a light fluffy texture). Spoon mixture into cupcake papers, filling each 3/4 full (do not over fill or else they will over flow). Bake for 15 minutes, then rotate the trays back to front and top to bottom. Bake for another 5 minutes or until a fine skewer/toothpick inserted comes out clean and the tops spring back when poked. Remove the cupcakes from the trays right away and cool on a wire rack until completely cool before frosting. Note: You can make these cupcakes in advance and freeze them. Just wrap them in 2's in glad wrap/ziplock bags and freeze when they are still a bit warm - this keeps them moist. Take them out of the freezer around a hour before you need to assemble the cupcakes. Beat butter for 1-2 mins till light and fluffy. Add the cream cheese and beat till just combined. Add 2 cups of the icing sugar, 1/4 cup at a time and beat for 1 minute till combined. Add vanilla essence, beat well. Add rest of the icing sugar 1/4 cup at a time until desired consistency (should be able to form soft droopy peaks but not be too oozy). I usually only use about 4 cups of icing sugar. Cut cone shaped holes out of the top of the cupcakes with a small sharp knife. This is where the toffee goes so go about half way down into the cupcake. The wider you make the cone, the more toffee you will get per bite. 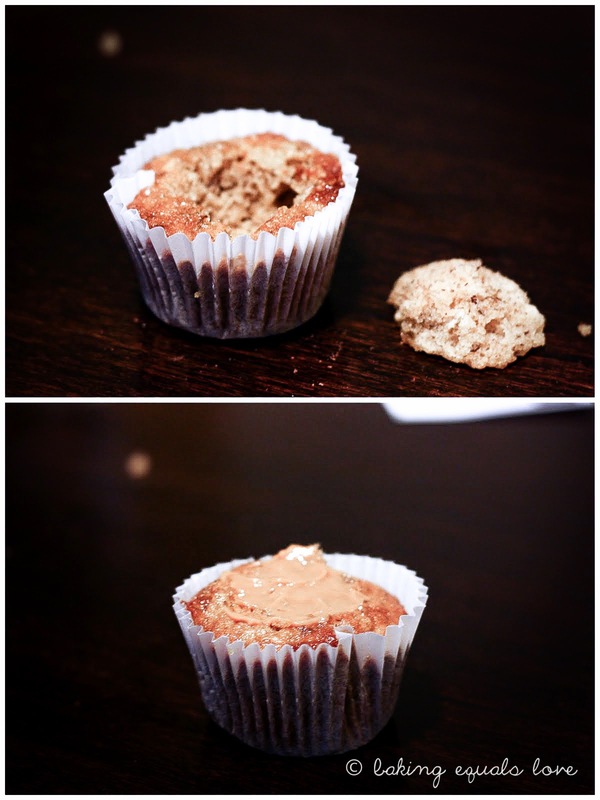 Spoon toffee into the holes in the cupcakes using two spoons coz the toffee will be sticky. Smooth the toffee with the back of a spoon to be level with the surrounding cake. Using an icing bag to frost the cupcakes either using a 1M star nozzle and pipe. Grate chocolate over the top of the cupcakes. They will keep for around 2-3 days in an air tight container (yea right!). No, my monitor it is not ready yet... but, I could't not comment to these wonderful cupcakes (although I use my son's little tiny notepad)... they should taste excellent and the image is great too!! Well well done! Those cupcakes look amazing. Thank you for stopping by PasstheSushi and leaving a comment! The brownies are gooey and amazing - and yet not that underdone fudge like thickness. I honestly think they were better the next day! They retained their moisture and were great. Ness just wanted to say a huge thanks. These cupcakes were amazing. N's family was blown away by them. Thank you so much for the recipe. Another very moist cupcake! This an amazing recipe thank you so much, my boyfriend loves them to, they are the only thing that he has asked for when he comes home from his tour in Afghanistan. I've just popped this mix into the oven.....can't wait to try them. I found even halving this recipe gave me 24 cupcakes......Now off to make the topping. Thanks!! Hello, could you please tell me how much is a cup? I am in Spain and a cup means something different in every country!! Hey, this is Helena from Spain, I just wanted to thank you I made your recipe and it was sooo good!